Joanne and Jorge Urioste, began climbing in Bolivia when guidebooks were unknown; thus route descriptions seemed superfluous to them. 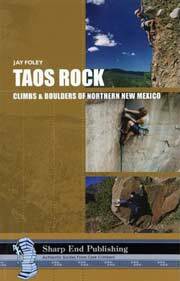 “On climbing trips we’d always look at “the mountain” and follow the most striking line”. 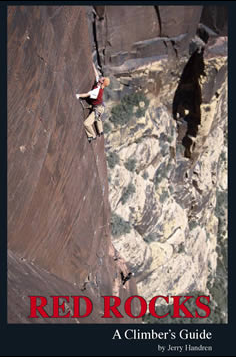 When The Urioste’s moved to Vegas in 1974 (Jorge took a job at UNLV as professor of anthropology), they applied their mountain ethics to the Red Rock sandstone, resulting in the first ascents of many of The Red Rock classics including Frogland, Epinephrine, Dream of Wild Turkeys, Sour Mash, Eagle Dance, Levitation, and Crimson Chrysalis, to name a few. Joanne is fluent in English and Spanish (BA in Spanish literature) and Jorge is fluent in English, Spanish, Italian, French, Quechua, Catalan, and some German. Joanne, now 65 years old, has been a registered nurse for 18 years. 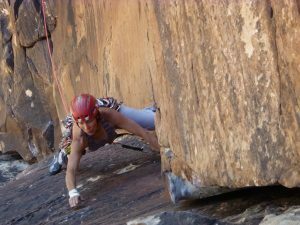 In recent years Joanne (who sometimes brings Jorge along as a guest guide) has taken up guiding with Mountain Skills in The Red Rocks and has been greatly enjoying interacting with our guests to facilitate their hopes and dreams. The depth and breadth of history and experience that Joanne and Jorge offer our guests in Red Rock’s Canyons is unrivaled and frankly they are a joy to be out in the mountains with! An abiding love of mountains has been the unifying theme of Joanne Urioste’s life. From her first ice axe in 1970 (which she re-forged at the local ironsmith shop), to her first climbing rack in 1971 (which consisted of a hammer and pitons, only)…. Many other adventures followed: She has completed six 100-mile ultra runs through mountains (including Hardrock 100), as well as doing The John Muir trail unsupported from Mt. Whitney to Red’s Meadow in 5 days flat (165 mountain miles). Joanne has also climbed extensively in the Peruvian and Bolivian Andes with Her husband, Jorge, especially during the 1970’s and 80’s, when few people climbed there and rescue services were unheard of. For Joanne managing risk was one of the most thrilling aspects of these grand adventures.